DANGAWAS in Nagaur district of Rajasthan is just 59 kilometres from the tourist town of Pushkar. 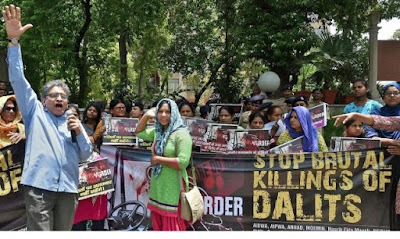 The village was in the news recently for the wrong reasons: the wanton killing of six persons on May 14, five of them members of a Dalit family. A dispute over the ownership of 3.77 hectares of land saw the majority residents of the village getting mobilised on caste lines, with the sole intention of “finishing off” the claimants to the land, who in this case happened to be 16 members of the Scheduled Caste Meghwal family. According to the first information report (FIR), a mob of around 200 Jats (survivors say there were more) chased them, beat them with sharp objects, set fire to their possessions including trolleys, and razed a brick dwelling that had been constructed on the field. Three people died on the spot and the others succumbed to their wounds in hospital. The dead and the injured were reportedly run over with tractors. The only person other than the Meghwals—Ratnaram, Pokarram, Pancharam, Ganpat and Ganesharam—to die was Rampal Gosain, a non-Dalit, who succumbed to injuries from a bullet. The source of the firing is still shrouded in mystery. Even the women of the Dalit family, young and old, were beaten mercilessly. They and some of the young men, who were admitted to the Jawaharlal Nehru Civil Hospital at Ajmer, are the only witnesses to the carnage. Some women alleged that they were molested. The events that led to the premeditated attack on the Dalit family started with Ratnaram Meghwal staking his claim to the piece of land by constructing a dwelling on it in the first week of May. He was, he reckoned, the rightful and legal owner of the plot. As such, Jagdish Narayan Sharma, Ratnaram’s counsel until recently, told Frontline that the sale deed to Chimna Ram could well be a fabricated one. Chimna Ram claimed title to the property in 1998 on the grounds that he and his ancestors had held possession of the land for the past 35 years. It was rejected in 2007. After Chimna Ram’s death the same year, his sons, who are the main accused in the May 14 attack, produced the sale deed claiming that the land had been sold to their father by Ghisa Ram. Ratnaram filed a counter-claim that year that the title was his, but he withdrew it subsequently. However, his sons filed a suit claiming that the land could have never been sold to Chimna Ram as the original owner was a Dalit. They also challenged the authenticity of the sale deed. After the court stayed further proceedings on the controversial sale deed, matters remained in limbo. Meanwhile, on April 10 this year, the Jat claimants dug up a small area within the plot for a pond. Ratnaram went to the police station to file an FIR, but the Station House Officer (SHO) of Merta police station did not think the matter was serious. On April 15, Ratnaram got a magistrate’s order to file an FIR. The FIR was registered on May 1. On April 21, Ratnaram’s widowed daughter-in-law alleged that she had been molested by Chimna Ram’s sons; this complaint of hers too was not taken cognisance of. Again, a magistrate’s order was required for the police to register an FIR. Despite her statement recorded under Section 164 of the Code of Criminal Procedure, no arrests were made. In the first week of May, Ratnaram, perhaps advised by his new counsel that the only way the matter could be settled was to take physical possession of the land even as the case over the title continued in court, decided to construct a dwelling on the piece of land. That proved to be his nemesis. Had the departments of Revenue or Land Records not prevaricated on settling the issue of ownership and title, the bloodshed could perhaps have been avoided. But seldom has the rightful ownership of land been restored to those in the lower rungs of the caste hierarchy. Revenue records show that the title to the land was with the Meghwals. There was no “mutation”, or transfer of title deeds, in the name of Chimna Ram Jat. Dangawas is a village dominated by Jats. According to the village patwari, of the 2,500 households in the village, there are 1,200 Jat families and 130 Meghwal families. The Meghwals are among the more outspoken of Dalits in Rajasthan. Compared with other Dalit sub-castes, they have done relatively better for themselves and are more assertive. In Nagaur, the Meghwals, despite their low numbers, were landowners and were not entirely dependent on the landed upper castes although a few of them told Frontline that land alone was not enough for economic sustenance and they worked for the other communities occasionally. “These are 21st century Dalits. The new generation has grown up with ideas of freedom and democracy. It is not easy to bully them anymore,” said a local resident. “They descended on us like animals. Even animals are not treated like this,” said Arjun Meghwal, whose father and brother were killed. His mother, Bidami, was admitted to hospital with fractured arms. Bhanwari, whose father-in-law was killed and who herself was admitted to hospital with fracture, told Frontline that the attackers molested the women. “I was hit on the head. I remember someone holding my arms and legs. I fainted after that. They hit us wherever they could,” she said. Her children had gone to school and except for them and a few others the entire family was in the field when the mob came attacking. The village was reportedly mobilised to teach the Meghwals a lesson. Rampal Gosain was called specially to join the “mela”, as one of his relatives described it. “This was the third such meeting that he had been called for in the past two months. He said he would be back for lunch. But we only got his body. It was a village matter. How could he have refused to join? It was only to ‘explain’ to the Meghwals that the crowd had assembled. We had nothing to do with them. They are Jats, we are Gosains,” she said. However, the Meghwals were never called to these meetings, she added. Like the Meghwals, the Gosains, with their 10 families, are a minority in the village. Rampal, who has left behind his widowed mother, his wife Sohni Devi, and three young children, all under 10 years, worked as a loader, apart from doing other petty jobs. The first arrests were made six days after the incident. Six persons were arrested though 12 people were named in the FIR. Following a lot of protests in Delhi, Ajmer and Jaipur, the case was handed over to the Central Bureau of Investigation (CBI). The Bharatiya Janata Party-led government of Vasundhara Raje reacted predictably. When asked by reporters about the slow pace of arrests, Home Minister Gulab Chand Kataria said the government did not have any magic wand. The government’s apparent reluctance to be proactive in the matter is understandable. Of the 25 Lok Sabha members from the State, seven are from the Jat community and there are around three dozen MLAs from the same community in the 200-member Assembly. The indifference of the administration showed itself in many ways. The Superintendent of Police (S.P.) and the District Magistrate of Nagaur reached the spot 36 hours after the incident. A Deputy S.P. and the SHO of Merta tehsil have been suspended. The Sub-Divisional Magistrate (SDM) of Merta has been given an Awaiting Posting Order. Indian Administrative Service probationer Nikya Gohain, the new SDM, was trying his best under the new circumstances. The administration could have prevented the massacre at various levels. One, by settling the land dispute, and two, by taking measures to prevent the orchestrated build-up of tension. “Land is going to be a major issue in the coming years. And the majority of disputes involve land that has been forcibly taken away from Dalits by dominant castes,” said P.L. Mimroth, chief functionary, Centre for Dalit Rights. It is estimated that there are around 1.5 lakh revenue or land-related cases pending in courts and one or the other litigant in each case happens to be a Dalit. Apart from posting police persons in the village and announcing some compensation to the dead and the injured, the administration has done little to clamp down on caste assemblies by the majority community. At the time of writing the report, a Jat mahapanchayat was being organised in a nearby village—as Dangawas was under prohibitory orders as per Section 144 of the Code of Criminal Procedure—in order to mobilise support for those arrested. A State Minister was present at the meeting. “When we visited the injured, they were so scared to talk. In the village, we found that the water supply to the Meghwal families had been disconnected and that they were taking drinking water from a pond. The compensation is very little and not enough for what the family has gone through,” said Kusum Sainwal, State secretary of the All India Democratic Women’s Association (AIDWA). She said that other Meghwal families in the village were also afraid to speak up after what had happened. The continuing caste meetings too had not helped in any way to restore confidence in the administration. So much so that the injured who are in hospital do not consider “going back” even though the administration has promised to make necessary arrangements and attend to their medical needs. The injured were attacked in the Merta tehsil civil hospital too where they were brought for treatment first. The doors and windows of the hospital were broken. The State Human Rights Commission did not think it a fit case to visit the village. It was only after P.L. Punia, Chairman, National Commission for Scheduled Castes, visited the village and other groups protested that a CBI inquiry was ordered. After the Dangawas incident happened, the Congress got into proactive mode, demanding amendments to the Scheduled Caste and Scheduled Tribe (Prevention of Atrocities) Act according to a Standing Committee report which recommended the setting up of special courts for offences against Dalits exclusively at the district level. But the fact is that even during the Congress regime, atrocities against Dalits continued unabated. Dangawas will never be the same anymore, said the residents of the village. The general feeling is that one had to abide by what the “village” wanted, which is a euphemism for the dominant community. “Had Ratnaram succeeded in his objective of securing titular possession of the land, he would have opened a Pandora’s box,” said a lawyer on condition of anonymity. It is doubtful whether the State government will intervene in the settlement of such disputes. The CBI’s investigation would at best reveal the cause of and the people involved in the murders, but the remedy, as is being recognised, lies in nothing less than land reforms and land redistribution. That is a tall order.